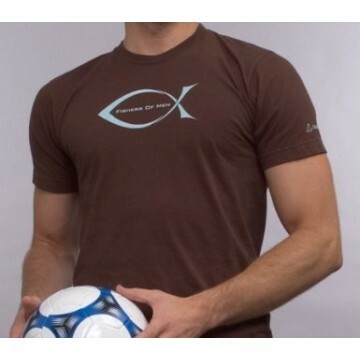 Brown Shirt with Aqua Blue Symbol Symbol: The word "Ichthus" is the Greek word for fish. 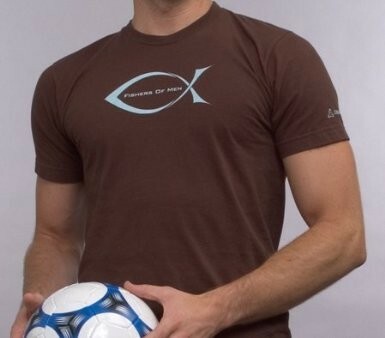 The spelling for the word "Ichthus" in Greek is "IXOYE". Symbol History: These letters also double as an acronym for the phrase "Iesous Christos, Theou Uios, Soter," translated "Jesus Christ, Son of God, Savior." In the earliest Christian times, under the persecution of Nero and other Roman emperors, Christians would use this symbol to recognize fellow believers and denote secret meeting places. One Christian would draw the top half of the symbol, and the other the bottom half. Scripture Passage: The phrase "Fishers of Men" is taken from Mark 1:17: "And Jesus said to them: Come after me, and I will make you fishers of men."